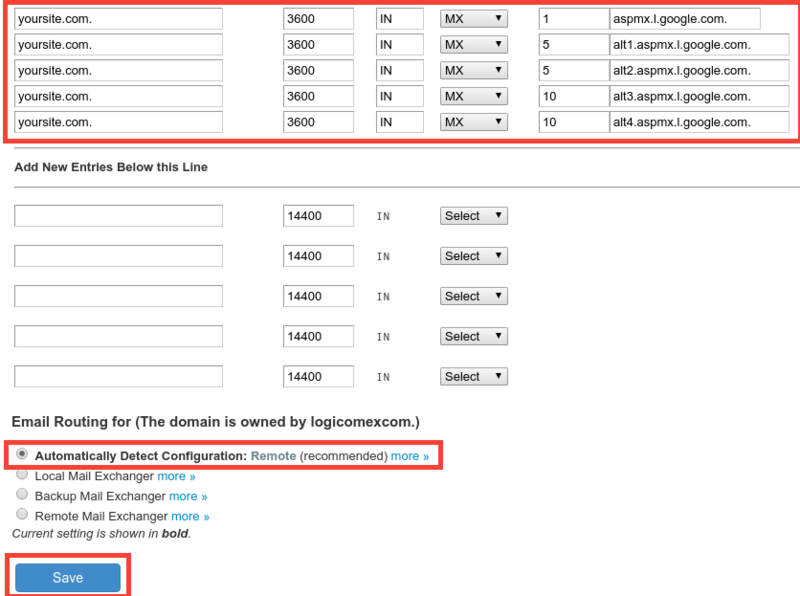 NixCP » DNS » How can I Configure Google MX records for on cPanel servers? How can I Configure Google MX records for on cPanel servers? Google Apps Mail is one of the best email services out there. But it needs some manual configuration on your MX records in order to work properly. Today we will explore how to Configure Google MX records on cPanel servers. If one of your customers or you in the last case, need to setup & configure Google MX records on cPanel servers, it can be done easily using WHM interface. Then search for the domain name where you need to setup the Google Apps MX records. Delete all the existing MX records. Finally, add the following 5 records, one per line after this option: “Add New Entries Below this Line”. dominio.com. 3600    MX    1         ASPMX.L.GOOGLE.COM. dominio.com. 3600    MX    5         ALT1.ASPMX.L.GOOGLE.COM. dominio.com. 3600    MX    5         ALT2.ASPMX.L.GOOGLE.COM. dominio.com. 3600    MX    10        ALT3.ASPMX.L.GOOGLE.COM. dominio.com. 3600    MX    10        ALT4.ASPMX.L.GOOGLE.COM. You will see an option called “Email Routing for”, and make sure you select/activate this option: “Automatically Detect Configuration: Remote”. Press save and that’s all. Important: ASPMX.L.GOOGLE.COM must be located at the top, as the first priority mail service. Do not move or alter the order of the MX records, or its priority. How can I verify Google MX records are working? Now you know an easy way to configure Google MX records on cPanel servers. Your Google MX records should start propagating really fast, and be ready within 1 hour (almost all cases) to 48 hours max, in the worst case. Remember that after this, you must create and manage all your email accounts from Google Apps Mail, and not from your cPanel server.